From Marilyn on 6th December 2006. Dave Badcock, proprietor of Harvey Weston, lives opposite Painshill in Cobham and offered to give a Guided Walk for the Signing on 5th November 2005. Due to late publicity only a few collectors came. This was a pity as it was another interesting and unusual Hazle event. 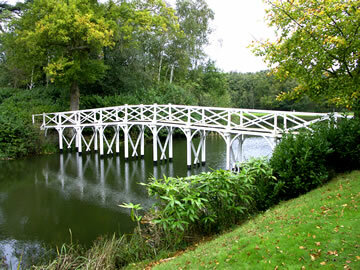 Painshill is a unique and award-winning restoration of an 18th century park. From 1738-1773 Charles Hamilton transformed barren heath into a series of subtle vistas, inspired by the 17th century artists of Claude, Poussin and Rosa. 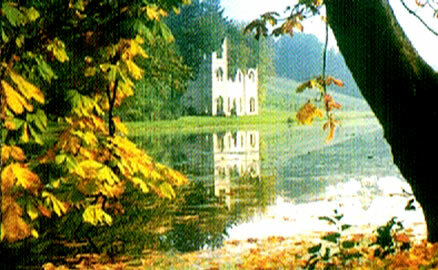 Visitors such as Thomas Jefferson from the US and Princess Ekaterina Dashkova from Russia admired his work, which influenced English landscapes for generations. 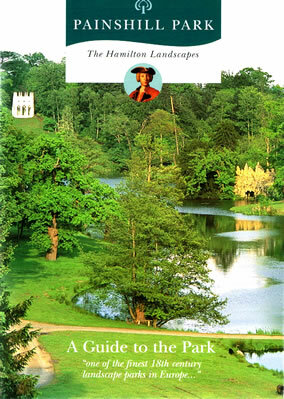 This Guide cover shows a picture of Hamilton, the Serpentine Lake, shoreside Grotto and Gothic Temple. 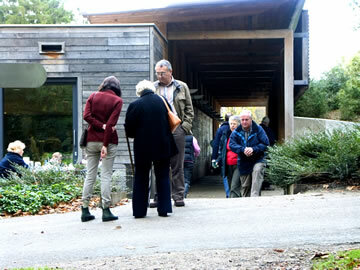 After visiting Painshill Cafe we start gathering at 2pm. Dave Badcock is in the centre. 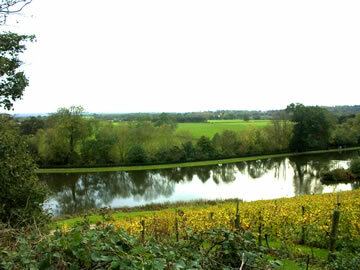 The vineyard right, which produces wine for Painshill Shop, offers a first view of the 14 acre lake. The lake islands and lakeside provide nesting sites for some birds, and the lake edge is good for flowering plants. The unpolluted lake is stocked with freshwater fish. The park is home to many mammals and 66 known species of birds. The first building we encountered was the Gothic ruin known as the Abbey. This was brick-built in 1772 as the last of the follies and rendered to simulate stone. Ruined buildings were very popular in gardens of this period. Made from timber and again rendered to resemble stone. Most of the park's outstanding features can be seen as framed vistas within its arches. 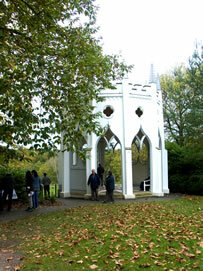 The Temple was also sited to attract the eye from many points on the estate. 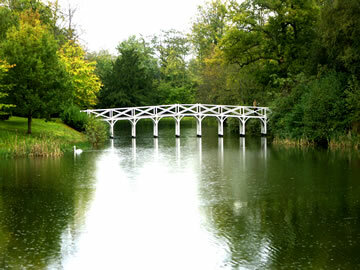 Crossing to Grotto Island, this was restored in 1988 and opened by The Prince of Wales. 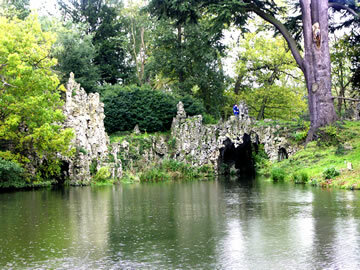 Descriptions of 18th century visitors suggest that this grotto, built across two islands, was the finest ever. The exterior openings frame the lake beautifully from inside. By mistake, instead of waiting for the Man with the Torch, we walked alone along the dark entrance corridor! This leads to the light and airy main chamber, being restored as funds permit. 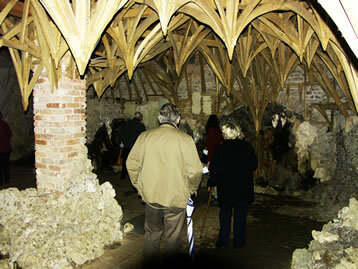 The vaulted ceiling has wood from Windsor Castle's fire in 1992. It will eventually be covered with plaster, minerals and stalactites. From a small pump-room water cascades around rock pools. Halloween events had just been held here and the place would be decked with fairy lights for the arrival of Father Christmas. 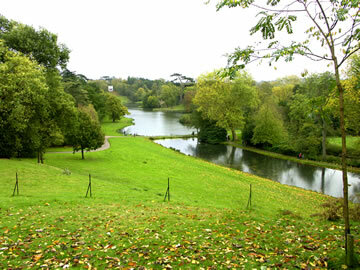 Here the park changes from ornamental pleasure grounds to a rougher style, known as the Wild Wood. The Waterwheel, built in the 1830s and restored in 1987, has a 35’ diameter and is a good example of Industrial Revolution exhibitionism! A low pressure system draws water from the well below to feed a cascade. A high pressure system once fed Painshill House, with complex pipework to many parts of the valley. 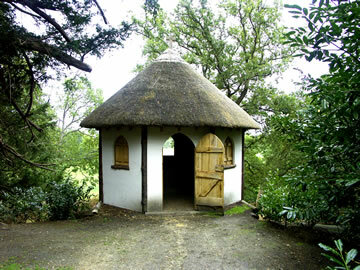 This became derelict and was chopped up for firewood in the 1940s! At the time of our visit it had just been re-built from an old drawing. 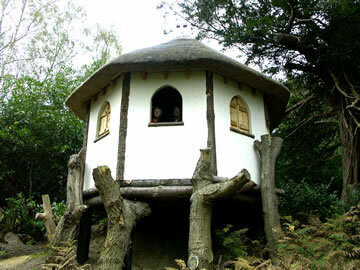 Excellent as an idyllic children's tree house - or perhaps a hobbit home. But as a permanent human dwelling - I don't think so! Inside there was only a bench and stool and I imagine it is very cold in winter. Apparently Hamilton advertised for a Hermit who would be paid 700 guineas for staying seven years - but the story goes that he lasted three weeks before falling foul of “the rules” by being found drunk in a nearby hostelry. But poor weather and visibility meant he couldn't see further than the A3 just below! 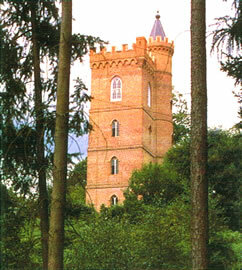 The Gothic Tower marks the furthest western reach of the park. Walking back in the direction of the Turkish Tent we passed the original site of the Temple of Bacchus, which Thomas Jefferson described as the most beautiful building in England. A large board revealed plans to rebuild it in 2006. Affording good views of the park, this was restored and made rigid, and then re-opened by the Turkish Ambassador in London. An old tree bark offers excellent camouflage for this nuthatch, one of the 66 bird species identified at Painshill. 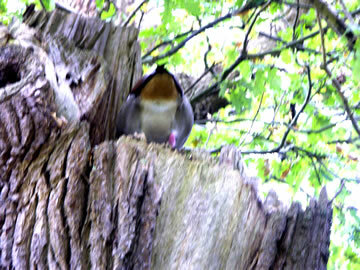 Nuthatches often nest in such places and make tree holes smaller with mud to deter larger birds. There is evidence of this in the hole on the left. 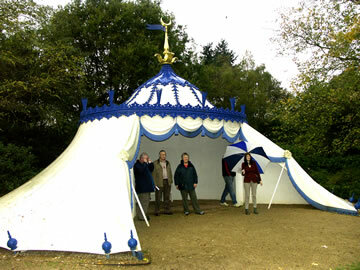 The view from the Turkish Tent was said to be one of Hamilton's favourites. The Causeway lake crossing is in the centre of the picture. Barely visible behind it on the right is the Grotto. The Gothic Temple can just be seen in the far distance on the left. This takes us back to the first part of the walk.